The picture was one of a handful of the Jupiter system that New Horizons took primarily for their artistic, rather than scientific value. This particular scene was suggested by space enthusiast Richard Hendricks of Austin, Texas, in response to an Internet request by New Horizons scientists for evocative, artistic imaging opportunities at Jupiter. This image was taken from a range of 4.6 million kilometers (2.8 million miles) from Io and 3.8 million kilometers (2.4 million miles) from Europa. Although the moons appear close in this view, a gulf of 790,000 kilometers (490,000 miles) separates them. The night side of Io is illuminated here by light reflected from Jupiter, which is out of the frame to the right. Europa's night side is completely dark, in contrast to Io, because that side of Europa faces away from Jupiter. Here, Io steals the show with its beautiful display of volcanic activity. Three volcanic plumes are visible. Most conspicuous is the enormous 300-kilometer (190-mile) -high plume from the Tvashtar volcano at the 11 o'clock position on Io's disk. 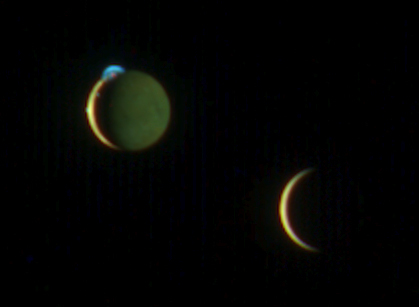 Two much smaller plumes are barely visible: one from the volcano Prometheus, at the 9 o'clock position on the edge of Io's disk, and one from the volcano Amirani, seen between Prometheus and Tvashtar along Io's terminator (the line dividing day and night). The plumes appear blue because of the scattering of light by tiny dust particles ejected by the volcanoes, similar to the blue appearance of smoke. In addition, the contrasting red glow of hot lava can be seen at the source of the Tvashtar plume. The images are centered at 1 degree north, 60 degrees west on Io, and 0 degrees north, 149 degrees west on Europa. The color in this image was generated using individual MVIC images at wavelengths of 480, 620 and 850 nanometers. The human eye is sensitive to slightly shorter wavelengths, from 400 to 700 nanometers, and thus would see the scene slightly differently. For instance, while the eye would notice the difference between the yellow and reddish brown colors of Io's surface and the paler color of Europa, the two worlds appear very similar in color to MVIC's longer-wavelength vision. The night side of Io appears greenish compared to the day side, because methane in Jupiter's atmosphere absorbs 850-nanometer light and makes Jupiter-light green to MVIC's "eyes." MVIC is a component of the Ralph imaging instrument.